The 'Marc vs Rossi' feud may attract more media attention but I personally find the 'Uccio vs Max' feud playing out in the Yamaha pit garage to be far more ruthless and interesting. There has always been bitter and savage rivalry amongst Rossi's friends as to which one will be selected as Rossi's 'No.1 best friend'. A title that earns you a 100% all financial expenses paid carefree life, as well as a front row seat to Rossi's life both professionally and personally. Amongst Rossi's friends Uccio has clearly dominated this area since childhood but behind the scene his position is always under constant threat from fierce competition. After Uccio's post race performance in Argentina he received an official warning from Yamaha to curb his behaviour or face permanent expulsion. A blow that could seriously cripple his ability to remain top dog. The 'No.1 best friend' competition could smell blood and none more so than Max, Uccio's strongest and oldest rival. This was demonstrated clearly at the very beginning of the FP1 session. When analysing the footage its clear from Max's body language that he is asserting himself as the dominant friend for the media and camera's. Within seconds Uccio administers strong retaliation, drawing the cameras away from Max and almost removing him from frame completely, then delivering a cheeky 'thumbs up' to draw all attention in on himself ... Being Misano and home ground for both Uccio and Max I have a feeling this could get uglier than Sepang 2015. RCV600RR, NJIRK and The Burning Barber like this. I didn't watch the Thursday PR rubbish, seems to me its a slag fest as to who is top dog. Having watched FP 1 and 2, even though the duc's came top Marc was easily the best rider out there and I imagine that will annoy Rossi. If Marc wins will we get more yellow idiots booing?
. 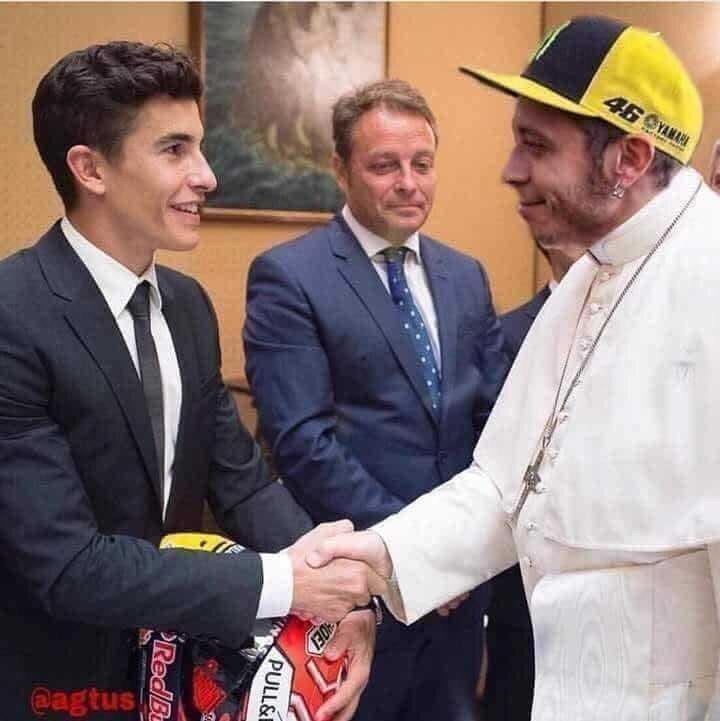 If Vale ever shakes hands or trust this guy again, I stop watching. BarryMachine, ratdeal, NJIRK and 3 others like this. While i agree with what you say i don't think Marquez needs to play any games with Rossi to beat him and have dominance on track,he's already got the beating of him and will prevent him from ever winning another title,i reckon he knows Rossi has had his day as far as championships go. I'm sure there are some good mental health professionals in Canada who could help you out.